I admit this is a plug, but I only plug the things I love. At the top of the list is Seattle Center for Book Arts! I have been a board member with SCBA for a year and a half now. This year we started a new Special Edition Print program. It is a fundraising effort that we hope will not only give print collectors a way to support us and get something in return, but also a way for us to support local book artists and market their names a little. The 2009 SE print was created by Carl Montford of Montford Press in Seattle. Carl is a favorite in the local book arts scene. A nicer man you have never met! 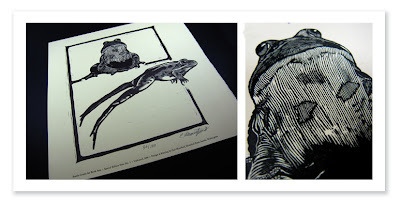 And an amazing artist to boot.... all of his work is ironpress printed from hand-engraved wood blocks. The detail is just stunning. SO, here is your chance to own an original Carl Monford print and support a non-profit that is making a big impact within the community. Buy yours here, and if you do attach a comment to this post. Once I confirm your purchase through SCBA, I'll send you a little thank you gift from Uncommon Envelope, too! Special Edition Print No.1, 2009 Edition, "Unbound"